I was looking for a device that I can carry everywhere (11 inch range, go here if you look for a 15.6 inch) since I needed to have access to my office remotely. I had a tablet, but it has less processor power, and a desktop for home computer. Then I settled on this Acer Aspire E3-111-C5GL to fit my needs, just fit in my purse, didn’t even feel it is actually with me. This laptop doesn’t have the best screen, but it isn’t the worst either. For my daily computing tasks, the 1366 x 768 pixels screen resolution is still ok, but couldn’t have it at the perfect brightness. I set the max brightness, and it gave a bit grained result on the screen. To me, the drawback of this laptop would be the brightness, but it’s still usable. If you purchase it, I suggest you to remove the preinstalled apps that you don’t want to use, follow this tutorial how to completely close Windows 8 apps. These days new computers are preloaded with manufacturers bloatware. More pictures in this page. No fan – very quiet. Since this computer has no fan, there is no fan noise. I hear the hard drive running once in a while, but overall, it is running quiet since it’s a fanless laptop. I’ve managed to get 5-6 hours with slightly heavy use for single charge. The laptop charges quite fast (which worried me on most laptops) – so I can carry it without charger except when I am on a working trip. Very easy and light to carry. If you need to walk a lot to go around with it, you’ll be amazed at how light this laptop is. I always have it mostly in my shoulder bag or purse, and it fits easily. Its not easy these days to get a new laptop that has a matte screen, but this one has it. It helps when you often use your laptop outdoor or in a bright room. Considering at the price, this laptop has impressive cpu performance. Compared to the E3815 Intel Atom cpu, this laptop’s CPU – Intel Celeron N2830 has absolutely higher clock speed (approx 50%), double l2 cache, which means, you can save more resources for quick access in the l2 cache, and double the cores which enable you to work with many apps at the same time. I managed to play games, Mass Effect and Dragon Age while other apps were closed. I am impressed with this little thing’s performance. The keyboard is similar to a mac’s keyboard. Although I sometimes miss the page up down keys on my home desktop, after getting used to it, the keyboard has a nice feeling. Find more info about this baby here. You shouldn’t get this laptop if you are a heavy gamer, video editor or graphic designer because it will fail to met your computing needs. And you should get this laptop if you needs a second device or mobility on a laptop that has a more powerful processing than a tablet. Basic and moderate use like email, surfing, skype and office work, will work with this device. For less than $250 price point, and many points, this device will absolutely blows its competition out of the water. Laptops that has this performance level are mostly sold at ~400 bucks. 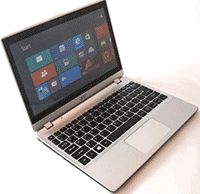 If you want a touchscreen laptop for around this price check out this laptop. I recommend this laptop for anyone who needs a lightweight laptop and don’t want to spend big money for a computer while still usable to do computing.